It's Tuesday, time for a slice of life! Come visit all the links at the Two Writing Teachers blog! It's also Poetry Month, and on Tuesdays, I am choosing to share a poetry lesson. This is lesson two, another about line breaks, but this time, I use poems to teach about enjambment, defined as the continuation of a sentence or clause over a line-break. 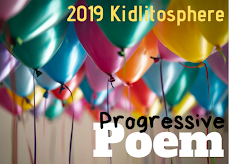 As a poetry group, before this lesson, we've already shared lots of poems we love by others, and read and responded to each others' original poems. We have talked about poets taking special care when they want the reader to pause, i.e., create a line break. I usually meet with the group only as a facilitator, and share tips and knowledge as it seems appropriate to what is being written or shared. There always is a good time for this lesson, one of revision. I cannot share the actual poems, but will give the links. What I've done in the past is to write out a poem in lines with spaces, just as I am writing now. I make the font rather large, like sixteen point, then talk about enjambment and how I would like the students to examine the idea by working with someone else's words. I've used the following poems. the kind of communication one believes is needed. This Moment takes just what the title says, one moment and describes the small actions happening right then. It's a challenge to think through where this poet is going to break up the lines. How To Paint A Donkey does almost the same thing, tells a small story, but here again, the writer chooses just how the lines are to be arranged. Questions to be asked about making changes in lines are the choice of when the reader should pause in order to vary the rhythm and to heighten the tension. Sometimes, we discuss moving lines around in the white space. Not only do the lines break, but they move, perhaps to heighten awareness of pauses, or for emphasis. I found students liked having the choice of where to place the lines, and it was always a good discussion when we looked at the published poems to compare those poets' choices with theirs. And, they liked the idea of having the power to choose in their own writing, but for good reasons. I am having a snow day today. The temperature dropped from 67 degrees to 22 last night and we're supposed to have 6-12 inches by afternoon. Give us snowy, blowy night. I discovered this post shared on Facebook this week, and the blog itself is one to check out. It's Teach With Picture Books, by Keith Schoch. This particular post is Ten Ways To Use Poetry. He writes two other blogs also, How To Teach A Novel and Teaching That Sticks. You can find the links on his website. Mary Lee Hahn, at A Year of Reading, has been writing some gorgeous poetry this past week, using media from the Creative Commons site and teaching about proper attribution at the same time. It's been a week of beautiful words written by her and a few of her commenters, along with learning and inspiration. Please visit! To the right are the writers for Irene Latham's progressive poem during the month at Live Your Poem. So far, counting today, nine poets have added their lines; it's a path that meanders, with surprises each day! If you’d like to see more of the spectacular happenings occurring in April, check out Jama Rattigan’s blog, Jama’s Alphabet Soup. I think she’ll be adding to the list as she finds out more, so keep checking in. Wonderful lesson, Linda! It is so freeing to realize how many choices you have for enjambment. I can't believe all the snow you are getting! Stay warm. Thanks Tabatha. It is cold, & I moved the winter coats to another closet last week! Silly me! SNOW DAY? Crazy, but then there's snow, still in Finland and I'm off on the 24th. Thanks Bonnie. I'm going to have time to watch your video today! No matter what, I think it will be great to go to Finland. Crazy to have a snow day on April 9th. You should move south! Love the lesson. Enjambment is one of my favorite things to work with in a poem. I played with spacing words this weekend with my post "Layer upon Layer." I am anxious to get back to poetry month with my students. This is state testing week, so I am testing a small group. I love the poem models you use. I am so excited that Naomi Shihab Nye is coming to our area this fall! What a pleasure it will be to see Naomi Nye, Margaret! This is a crazy weather day, but guess we'll take the moisture when we can get it. OH, fun, Ruth! I do like the word, too! And the students loved learning a new term. Thanks! I thought about you when the weather talked about the storm in your world. Glad you are safe at home! Great lesson Linda! Those links are such an awesome resource, so thank you for that too. The one new one I talked about just finding is just filled, Elsie. I'm so glad you will use them! I'm so lucky to have this be my 'working' day for your progressive poem, Irene. It is a gift of a day! This is a great minilesson idea -- thank you! You're welcome, Ruth. It is fun to do! I love this, Linda! I always play with my line breaks when I write poetry, but I didn't know the terms for it. I'll have to come back to this post when I try some of these with my students next time. Thanks, Maria. I hope the poems will be helpful too. Thanks! You just said something I actually proposed to that new blog post I shared, that his information would be so wonderful to have in August or September, to use all the year, instead of just April. Best to you in finding things that will help. I think that freedom you give your students is the key to unlocking poetry. As soon as you realize a poem can be anywhere or anything or look any way you want, a door opens and your poems come out. Great ideas, so glad you shared them. I agree so much with you, Betsy. Choice is such a key & my students wrote and wrote with such enthusiasm. Thank you for noticing. Linda, I often find myself wishing my students were a little older when I read your lesson ideas. I don't actually want to teach older kids but I'd sure love to give your lessons a try! I've lately been teaching riddle poems with 6 & 7 year olds Robin. We've talked a little about 'making the lines sound good', not enjambment of course. Thanks-& good luck with the little ones! P.S. I can't believe it's SNOWING for you! We're having just the opposite here -- today my car thermometer said 82 on the way home! Your idea for the smart board is wonderful, Jennifer. I imagine the students would have lots to say about where the words go! As for the weather, it's still snowing a little & we haven't had much, but it's so cold-supposed to be 8 degrees tonight. Crazy times! These are such great ideas LInda. I'm saving them for when I teach poetry again next year. Kids just don't get the line break thing and I like how you approach this. Thank you Deb. I hope it will be a good exercise for you. Hope spring is not being to hard on you with this storm we just had! Nice lesson, Linda! Hey, I went north to visit family, and it snowed here today too! Looked like the start of winter again! I know, crazy time. It's supposed to be a low of 8 degrees tonight. I cut the daffodils yesterday & they are now glowing 'inside'! Sorry for your snow too! Enjambment, a new term for me. Thanks for the ideas of how to share it with students. I'm off to the library to pick up some more poetry books that have arrived. Thanks for all the great links for this month. You're welcome, Ramona. Your poetry 'basket' must be overflowing by now, after today & your Friday book day! I'm so sorry about the snow, but I love your poetry lessons! Thank you for all of the links, as well. Who says that you can't address Common Core standards with poetry? I'd like to hear their argument when you show how closely poetry readers must read, and how much revision work poetry writers must practice. Hoping for sprIng for you Linda! The snow will 'green' everything up, but it was a bit of a shock from short sleeves to winter coats! I think there are so many children's poetry books that require strong research that the common core should invite it! I heard the news of the storm and though I was slightly jealous of those tweeting a day off, I am much happier to be enjoying spring. I've had enough of the "snowy, blowy night" for now. Thanks for sharing so much here today, Linda: a lesson, a poem, good books, many links. Much appreciated! You are welcome, Cathy. The snow is still drifting down & it's so cold, & I know how you feel about the day, yet I enjoyed every bit, a little gift in return for more wool socks! Linda- Read your post yesterday, then got distracted reading the three poems and realized I never commented. I have taught line breaks for years, but have never heard of enjambment. And I love the idea of teaching kids about moving the lines around-- I don't think I have ever taught that either. Thanks, too, for the terrific links. Will share Teach With Picture Books link this morning, and the others later. OK, now off to get ready for work- think the drive is going to be way worse this morning than it would have been yesterday! Thank you Carol, happy that you like that link, & learned about enjambment! The Teach With Picture Books post is amazing, very helpful! Yes, I'm fearful about my car starting-so cold! I really enjoyed the three poems you linked to. First Grade made me laugh--so true! I was lucky enough to win the book, The Ode Less Travelled, from you for the Slice of Life Challenge. I wanted to thank you for it and let you know how excited I am to get a chance to read it. Thanks so much! How funny. I was just thinking of you and the book yesterday or today, & hoping that you received the book. Congratulatlons on winning, & thanks for coming by. I have read about half the book & then was diverted, so haven't gotten back to it. Best wishes for spring. Are you continuing to blog? I have plans to do the Slice of Life every Tuesday, but I just haven't made it a priority yet. I was on vacation and then I was trying to get back into the routine and totally spaced Tuesday. Thanks for the encouragement. Let me know. I'll look for you! !